Jodi Vaughn is completely new author to me. I participated 3 Days of Paranormal Romance Fun internet event, signed up for authors ‘ newsletters and ended up getting e-books free of charge. By the Light of the Moon was one of them, it is the first in the Rise of the Arkansas Werewolves – series. And the very first werewolf book I’ve read. The book is about Damon, a biker werewolf. Outsider in a insider job as he works as a guardian for the Arkansas pack. Just another day at work turns into rescue mission, and the damsel in distress… Ava’s smart, witty and has no idea that she’s a werewolf too. Their story is nothing to be taken too seriously, but fun reading. 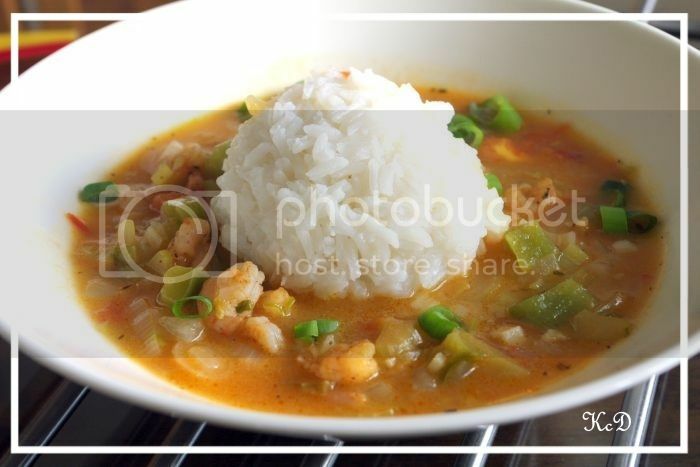 Crawfish etouffee was served around middle of the book. Since I live in Finland, crawfish are never in season apart from European crayfish season from July to October. So I had to use frozen shrimps as subsitute. Despite of the run-down appearance of the outside of the building, the inside was very clean. As they wound their way through the kitchen, her nose was assaulted by the tempting smells. By the time they reached the bar, her mouth was watering. “We just ate.” Damon shook his head. “That sounds great.” She gave the man a grateful smile. 1. Defrost the shrimp according to the instructions. Place on a paper towel to dry them. 2. 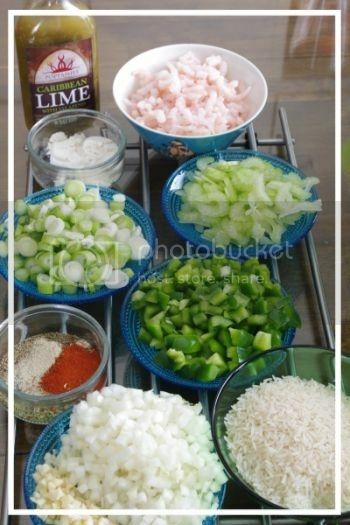 Chop the onion and garlic into fine pieces and cut the celery into thin slices. 3. Dice the bell pepper and tomatoes. 4. Mix ground paprika, thyme, oregano, white pepper, black pepper and salt together. 5. Take a teaspoon of the spice mixture into a bowl and add the shrimp. Toss to coat them in the spices. 6. Heat 1 tbs butter and 1 tbs olive oil in a large pan until hot. Cook the shrimp for two minutes; first for a minute without stirring and then stir and cook a minute more. When cooked, pour them back into a bowl and set aside. 7. Add the rest of the butter and olive oil, then sauté the onions, garlic and celery, tomatoes and bell pepper in medium heat until softened. Pour in the remaining spice mix. 8. Sprinkle the wheat flour on the vegetables and sauté until combined thoroughly. 9. Add water and let the sauce simmer until it thickens. 10. Add the hot sauce. I added 1 tbs Caribbean Lime sauce by Finnish hot sauce & spice company Poppamies. The Caribbean Lime hot sauce contains jalapeno, cilantro, garlic and lime. 11. Add the shrimp and let them simmer until cooked, for about 1-2 minutes. Add salt if needed. 12. Garnish with green onions and serve with rice. By the Light of the Moon is the very first werewolf book I’ve read. And I liked it. It is also first book by Jodi Vaughn that I’ve read. The book had a lot of what I assume are typical clichés for the werewolf genre; a lone biker, an outsider that becomes a hero. But then again I found a lot of similarities to the vampire genre too (bonding scent, one true mate etc.). Damon is an outsider inside the Arkansas pack. He works as a Guardian for the pack and one night at work suddenly turns into a rescue mission. A mission that has consequences. Ava is the General’s daughter. She’s tired of being told how to live her life. When she’s kidnapped by a pack of rogue wolves, everything changes. I liked the story and as it was first in the Rise of the Arkansas Werewolves – series, I’ll probably read at least the second one too just to find out if it gets better.